Sound "The Teslas have an abundance of strengths, not the least of which is a seemingly unearthly ability to portray a three-dimensional soundstage." "It enveloped the room and appeared to change position based on where the microphones were located when the recording was made." "Also...grunge and harshness appear to be missing in action, thus setting the stage for an awesome display of delicacy and microdynamic subtlety." And "the Tesla cables were dead quiet -- eerily so." Features "Active shielding begins with a 30-volt high-current DC bias applied to the shield of the cable. This voltage enters the drain conductor through a thin wire called a "pigtail." The pigtail is terminated with a 1/8" miniplug on the cable side. This connects to a small active power supply called a "mini power coupler," "MPC" for short. The end result, according to Synergistic, is an electronic shield that prevents the signal from interacting with the cables dielectric, thus reducing phase and time distortions." "What Denney discovered from Teslas work was that by not distancing the conductors but rather aligning them in a close, symmetrical geometry and using materials that would control resistance, capacitance and inductance, a cable could be created that would function as an electromagnetic 'lens.'" Use "Synergistic is adamant that even for state-of-the-art systems, the most expensive cables are not necessarily the best choice. The careful unveiling of accurate tonality and harmonics within any given system often requires, for example, that the top-of-the-line Apex cables be matched with one or more of the less expensive offerings to achieve a well-balanced presentation." "According to Synergistic, the Tesla cables take at least 300 hours to break in." Value "The extra money spent on the Apex interconnects and speaker cables brought about commensurate improvement in sound quality, which is what such an upgrade is all about." Synergistic Research is not your grandfathers cable manufacturer. This company is known for making interconnects, speaker cables and power cords that utilize a number of high-tech design features. Synergistic is most renowned for its use of active shielding, a technology that it first adopted almost 11 years ago. 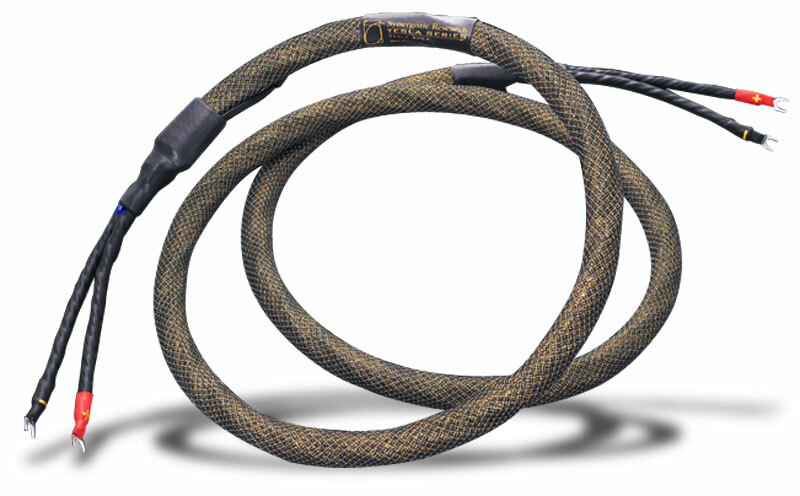 I first used Synergistic cables in my system around 2003. 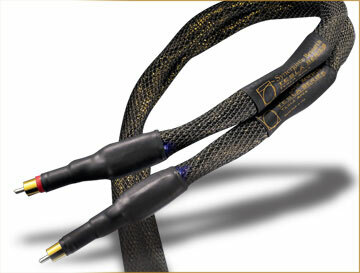 At that time, the company, guided by lead designer Ted Denney, had just introduced its active X2 cables. These replaced the active X-series cables, which had, in turn, replaced the aptly named Active Shielding cables. Shortly after they were introduced, the Active Shielding cables were highly regarded by audiophiles and particularly well known for their incredible detail retrieval, lush midrange bloom, authoritative bottom end and grandiose soundstaging. If truth be told, however, like all audio products, the Active Shielding, X and X2 cables had their tradeoffs. Along with their eye-opening strengths, they were a tad harsh and grainy in the upper frequencies. They also rendered a very forward presentation. Add to these qualities the absolutely massive amount of information that they conveyed and you can understand why these cables could be fatiguing in some systems. Nonetheless, while these early cables may not have represented perfection in terms of the active-shielding technology, it was clear that Synergistic Research was onto something. Fast-forward to 2009, where over the last six years a lot has happened at Synergistic. During that time, the company has pushed its active-shielding technology forward, and the X2s have been replaced by the new fourth-generation of active-shielding cables, the Tesla line. The Tesla cables are derived from the theories of Nikola Tesla (1856-1943), who is widely recognized as one of the most brilliant inventors of the modern age. Teslas work formed the basis for the development of alternating current, thus paving the way for the second industrial revolution. When I saw Ted Denney at a recent audio show, I inquired about the possibility of reviewing some of his Tesla interconnects and speaker cables. He was receptive, and it wasnt long before he was flying across the country from Synergistics Irvine, California factory and headquarters to personally "dress" the cables in my system. Notice that I say "factory." Synergistic is one of the few cable companies that actually manufactures its cables in-house. Some design the products and have them made overseas. When Denney got to my apartment, he was bearing the Tesla Apex speaker cables ($6500 USD per eight-foot pair) and two types of interconnects: Apex and Precision Reference ($3600 and $2600 for a one-meter pair, respectively). Within the Tesla family, the Apex sits at the top of the heap, at least as far as price is concerned. Below it, in descending order of price, are the Precision Reference, Acoustic Reference and Accelerator models. Synergistic is adamant that even for state-of-the-art systems, the most expensive cables are not necessarily the best choice. The careful unveiling of accurate tonality and harmonics within any given system often requires, for example, that the top-of-the-line Apex cables be matched with one or more of the less expensive offerings to achieve a well-balanced presentation. That was the case with my setup, as I'll explain below. Active shielding begins with a 30-volt high-current DC bias applied to the shield of the cable. This voltage enters the drain conductor through a thin wire called a "pigtail." The pigtail is terminated with a 1/8" miniplug on the cable side. This connects to a small active power supply called a "mini power coupler," "MPC" for short. The end result, according to Synergistic, is an electronic shield that prevents the signal from interacting with the cables dielectric, thus reducing phase and time distortions. Over the years, Synergistic made evolutionary improvements to the active-shielding technology. Then, in early 2005, while sailing on his boat in the South Pacific, Denney began reading about the work of Nikola Tesla in an attempt to find a way to make cables that were smaller, lighter and more flexible than the high-end cables that were then available. One way that cable designers had increased the performance of their cables was by physically distancing the conductors. This resulted in the thick, unwieldy beasts with which we audiophiles are so familiar. What Denney discovered from Teslas work was that by not distancing the conductors but rather aligning them in a close, symmetrical geometry and using materials that would control resistance, capacitance and inductance, a cable could be created that would function as an electromagnetic "lens." According to Denney, such a lens, which manages electromagnetic fields in much the same way that a glass lens focuses light, concentrates alternating current and its subsequent electromagnetic fields while exhibiting extremely low distortion. After a massive amount of research and testing, three primary Tesla geometries emerged -- tricon, acoustic and vortex -- each of which possesses different harmonic characteristics. By combining one or more of these geometries, the resulting cable can be made to complement systems with varying equipment designs and tonal balances. While developing the Tesla cables, Denney made an additional breakthrough, what he calls "quantum tunneling." This, according to Denney, involves subjecting the cable, for a precise amount of time, to a two-million-volt high-frequency signal at a specific pulse modulation and frequency. It resembles something from the movie Frankenstein, complete with the requisite bolts of electricity that shoot into the air and appear capable of bringing life to the dead. In fact, due to the large number of electrons that are released into the environment during this process, the florescent lights in Synergistics factory illuminate even though they are not turned on! According to Denney, this process alters the way a conductor transmits electrons. How do the results of this process differ from that of cryogenic treatment? While there are several different ways to cryogenically treat cables, I have found that cryod cables generally offer a more relaxed and refined presentation, as well as a touch more detail and openness. Based on my limited experience with a power bar and single interconnect that were treated, the process performed on the Teslas also removes grain and harshness, while increasing detail retrieval, but it does so much more dramatically. It also lowers the noise floor, improves the sense of air, imbues a holographic quality to the soundstage and increases dynamic extension. As I mentioned, before installing the Tesla cables, you must first determine which ones are best for your system. This is not a straightforward exercise. For my system, Denney placed the Precision Reference interconnects between my preamp and amplifier and the Apex interconnects between my preamp and CD player, before finally installing the Apex speaker cables. Once you have settled on the right cables and gotten them connected to your components, you must determine where to plug in the MPCs. The more active cables that you have, the greater your need for AC receptacles. Not to worry -- Synergistic provides a solution to this issue with its new QLS quantum-tunneled power strips. These accept either six or nine MPCs depending on the model. These will not only satisfy your need for additional AC outlets but will also improve the performance of your cables. Moreover, although these power strips come standard with non-active power cords, Synergistic recommends that, for increased performance, the cords be upgraded to Tesla T2s, which have their own active pigtails. I know what you are thinking -- using an active power cord to power the active shield of a speaker cable or interconnect (or worse yet, another power cord) constitutes an act of sheer madness. Once the cables are installed and their shields activated, a small blue LED lights up on every cable. This not only looks cool but is extremely useful. When the LED is illuminated, you know the active shield is working. It was at this point that I thought I was finally ready to listen -- not. According to Synergistic, the Tesla cables take at least 300 hours to break in. So I turned on my system and left it running for at least that long. Then it was finally time to bring the beast to life. It doesnt take much listening to realize that the Teslas represent an all-out assault on some of high-end audios most venerated cables. Indeed, the Teslas have an abundance of strengths, not the least of which is a seemingly unearthly ability to portray a three-dimensional soundstage. On the Comarsa CD (Sony Music BK 68726), Deep Forests world-ambient beats took on a holographic quality with the Tesla interconnects and speaker cables in my system. Instruments were layered and surrounded by enormous volumes of air and space. Unlike with Synergistics earlier cables, the soundsage of the Tesla interconnects and speaker cables was not set forward. Rather, it enveloped the room and appeared to change position based on where the microphones were located when the recording was made. In fact, the soundstage was so expansive that it at times it seemed to extend beyond the walls of my listening room. The opening synthesized sounds of "Madazulu" from Comarsa, for example, appeared to be coming out of my adjoining bedroom. On Annie Bissons "Do What You Please" from the Fidelio Reference 2 CD (Fidelio FACD910), the Tesla cables carved out a space for Bissons voice within the middle of the soundstage that was distinct and unwavering. This contributed to the cables' ability to achieve exceptionally developed image solidity. Many cables dont properly size Bissons voice, often portraying it with elephantine proportions when compared to the accompanying guitar. However, while the Teslas created an enormous soundstage, they did not depict Bissons voice in an oversized way. In fact, small-scale instruments like piccolo and violin sounded realistically small, and large-scale instruments like bass drum and organ sounded realistically big. Also, unlike with earlier Synergistic cables, grunge and harshness appear to be missing in action, thus setting the stage for an awesome display of delicacy and microdynamic subtlety. On "Ran-Man" from John Fukamachis At Steinway (Take 2) CD (LIM DXD 038), the notes of the Steinway concert grand piano demonstrated ultra-fine gradations of frequency and intensity. Similarly, the xylophone on "Timeless" from Larry Coryells Three Guitars SACD (Chesky SACD289) was rendered with lifelike palpability that uncovered what seemed like microscopic timbral shifting. But while the Tesla cables displayed tremendous finesse and refinement, they did not come at the expense of transient speed and raw dynamic extension. The introductory chimes on Pink Floyds "Time" from the Dark Side of the Moon CD (Capital CDP 7243 5 82136 2 1) displayed the type of upper reach and decay that brought me a case of audiophile goose bumps. Transients were rendered with seemingly steroidal speed that caused drums to "pop" and make me realize that when I had previously heard them they were muddied, slow and compromised. I know that you have read before that this or that cable uncovered some small bit of minutia that was previously undetected. However, the Tesla interconnects and speaker cables revealed aspects of recordings that I thought I had long ago wrung of every possible detail. These included random noises, such as the movement and breathing of musicians, the puckering of lips and even the sounds of street traffic from outside the recording studio. They also included more musically important elements such as voices and notes. On "Dont Cry" from Seals Best: 1991-2004 CD (Warner Bros. 48882-2), for example, the Teslas clearly revealed Seal counting off the beat just under his breath. The Tesla cables were dead quiet -- eerily so. For example, during several parts of "No Flight Tonight" from Three Guitars, Coryells guitar appears on the left portion of the soundstage while Badi Assads body percussion is positioned in the center. With the Tesla cables, the absence of low-level noise from the right portion of the soundstage was so complete that I wondered whether the Apex speaker cable had somehow come unplugged from the binding posts of my right speaker. As confirmed by a trip out of my chair to inspect the connections, however, all was well. The cables were just that silent. Moreover, the Teslas seemed to be able to decipher complex spatial and harmonic information that lesser cables simply couldn't. An example of this was the Teslas ability to pluck individual voices from grouped vocals. This was aptly demonstrated on "Love Is Stronger Than Pride" from The Best of Sade CD (Sony Music EK 66686). Here, the vocals are almost exclusively carried by Sade. However, in several places, vocalist Leon Osborne softly shadows her voice. Many lesser cables obscured, even fully masked Osbornes contribution. However, the Tesla interconnects and speaker cables reproduced two distinct voices with clarity, spaciousness and distinctness. Yes, the Teslas seem to be made to blow through audiophile benchmarks. But are they musical? Heck, yeah! With the Tesla interconnects and speaker cables in my system, all I wanted to do was listen to music. In fact, I left my system playing even when I was not engaged in serious listening and just doing other things around the house. I rarely do this, as it pulls me away from doing things that need to get done. This is not to say that the Teslas always sound good, however. The harmonic character of each of the Tesla products must be carefully paired with that of the components that the cables are used with. Here, mixing and matching revealed that the Precision Reference interconnects are a bit faster and sharper than the Apex, but dont quite have the Apexs lush midrange bloom. The Acoustic Reference possesses an even more romantic midrange than the Apex. However, it lacks the Apexs soundstaging abilities, weight, dynamics, detail, air and speed. Thus, the Tesla cables are not the type you purchase and toss haphazardly into your system. While they will reward the knowledgeable and deliberate, they will penalize the undiscerning and incautious. Make sure that you consult with your dealer or Synergistic before purchasing. I compared the Tesla Apex speaker cables to my current speaker cables, the Synergistic Tesla Accelerators. The Accelerators, which retail for $1775 for an eight-foot pair, constitute the entry-level cable in the Tesla line. The Accelerators will do some of the things that the more expensive Apex can, but not nearly everything and not to the same extent. What the Accelerators will do is give you a taste of the Apexs holographic soundstaging and air, as well as a bit of its detail. What they wont do is give you that last bit of detail. But much more important, they wont translate the complex cues that are necessary to create nuance and fluidity, and thus realism, in even the most seemingly simplistic musical passages. I also compared the Tesla interconnects to my DIY interconnects, which consist of RCA connectors from Bocchino Audio paired with silver-conductor interconnect cable. These interconnects are no slouches and they arent particularly cheap. One manufacturer sells a very similar interconnect in finished form for about $1500 a pair. Not exactly the price of either the Apex or the Precision Reference cables, but nothing to sneeze at either. Reverting back to the DIY interconnects exposed deficiencies in them that were now painfully obvious. Gone was the air, three-dimensionality and pinpoint imaging. Instruments once again sounded flat and one-dimensional. Upper-end extension diminished and radiated a noticeably harsh and fatiguing energy. In a certain sense, neither of these comparisons proved much in terms of a pecking order for the products compared. However, in both cases, the extra money spent on the Apex interconnects and speaker cables brought about commensurate improvement in sound quality, which is what such an upgrade is all about. While no technology can ever be said to be fully perfected, the various Tesla Apex and Precision Reference cables I used are proof that Synergistic Research has taken what was, by all accounts, a very good set of products and propelled them into a whole new league. While the process that Synergistic calls quantum tunneling is rather cryptic, I have heard a lot of cables, and just a half a song's worth of listening made it clear that the Teslas are special, possessing an uncanny ability to let more music flow through my system, and thus to my ears. In fact, the Teslas are so exceptional that they will certainly ruffle more than a few feathers in the rarefied world of ultra-high-end cables, where "cabling up" a system can cost more than a car. Seen in that light, even at a collective price of almost $13,000, the Tesla Apex and Precision Reference interconnects and speaker cables represent a shrewd buy. And if you still think that using an active cable to power the shield of another active cable is sheer madness, open the large, heavy doors to the insane asylum, because I'm pounding on them to be let in. Prices: Apex interconnects, $3600 USD per meter pair; Precision Reference interconnects, $2600 per meter pair, Apex speaker cables, $6500 per eight-foot pair.